However tentative is our understanding of the dynamics of FPOM originating in leaf litter, even less is known about other FPOM sources, which could be of equal or greater magnitude (Table 7.1). DOC enters the particulate pool via a number of pathways, and probably in substantial amounts. Input of fine particulates from the forest floor, soil water, and banks and channel of the streambed all can be substantial. Algal cells sloughed from periphyton mats and washed out of lakes and beaver ponds also contribute to total FPOM. The quality of FPOM originating from terrestrial ecosystems is influenced by the composition of the terrestrial vegetation, position along the river network, and temporal variation in discharge. Several characteristics of fine benthic OM (FBOM) differed among Oregon stream sites in old growth forest dominated by Douglas fir and western hemlock, and young growth stands of Douglas fir and herbaceous vegetation with abundant deciduous trees in the riparian zone (Bonin et al. 2000). 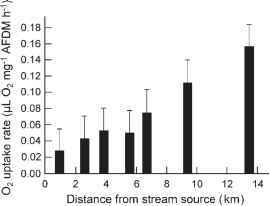 The FBOM of streams flowing through young growth stands had lower C/N ratios and higher denitrification potential, as well as greater extractable ammonium, phos-phatase activity, and respiration rates, suggesting higher substrate quality and microbial activity compared with streams in older stands. The quality and amount of inputs of terrestrial POM likely are higher at young growth sites, and an observed increase in microbial activity following a storm is evidence of system response to a pulsed input. Benthic respiration and thus mi-crobial activity have also been observed to increase as one proceeds downstream (Webster et al. 1999), which may be the result of changes in OM quality as well as higher temperatures, greater nutrient availability, and increases in substrate quality related to higher algal POM inputs (Figure 7.12). nor bacteria contain lignin, and so its presence establishes that the material originated as vascular plant tissue. Lignin oxidation products are indicative of the type, concentration, and degree of preservation of the plant source. Stable C isotope ratios distinguish C-4 grasses from other plants, and the atomic C/N ratio is highest (~20) in relatively unaltered plant detritus, whereas lower values (~ 10-12) are characteristic of well-decomposed soil OM (Hedges et al. 1986, Devol and Hedges 2001). Employing such techniques, Hedges et al. (1986) analyzed FPOM from the Amazon River by comparing the signatures of river particles to various potential organic sources. They concluded that the majority originated as soil humic material, and at least for large rivers, this conclusion appears to be general (Onstad et al. 2000, Bernardes et al. 2004, Townsend-Small et al. 2005). Based on the ratio of C/N atoms in river seston worldwide (Meybeck 1982), the majority of riverine FPOM most closely resembles soil OM. Lower C/N ratios in FPOM than CPOM and DOM could be related to the presence of microbial biomass or clay minerals (Hedges et al. 1994, Devol and Hedges 2001). Even in headwater streams, our detailed knowledge of the leaf breakdown process not withstanding, it seems likely that most FPOM originates from sources other than fragmentation of leaves. Based on rough calculations of the magnitudes of inputs attributable to soil OM and the breakdown of wood, Ward and Aumen (1986) concluded that leaves and needles were minor sources of FPOM. Sollins et al. (1985) used flotation to separate organomineral particles from fragmented plant material collected from small forested streams in Oregon. The majority of detrital C and N was present as organic material adsorbed on mineral surfaces, rather than as plant fragments.